Embassy attestation is not obligatory for authorization of visas to visit or remain in Oman for studies, business or employment purposes. To ensure that the documents you submit before the Oman authorities are genuine, it is necessary to have your certificates attested. Attestation is to be done through the Oman Embassy in your home country is not required for Oman. Apostille Attestation from the MEA is the requirement for Oman. Oman accepts MEA Apostille attestation for all the documents issued from India, because Oman is a members Apostille Union. MEA Apostille:The documents are to be attested from the Ministry of External Affairs. For Sultanate of Oman, being a member of Hague Convention, one is required to get an MEA Apostille attestation. 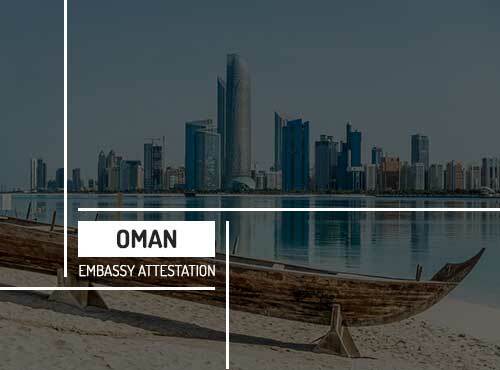 Embassy Attestation: Here, you are required to submit the attested documents from MEA to the Oman embassy in your home country for verification. Certificate attestation is an arduous and time-consuming task that is best left to professionals. Moreover, it is confronted with hassles of constant updates and visits to various departments throughout the country. Proficiency and know-how are important ingredients when the matter involves step by step verification and attestation of significant documents. Thanks to the service of Urogulf, one is considerably spared of the tedious and weary burden of running after the cumbersome attestation processes. When you hire Urogulf for Oman embassy attestation services, our team of experts will guide you through all your attestation procedures. Our team will aid you to complete the attestation process in the most secure means possible. The principal benefit you gain on availing the service of Urogulf is that you can live- track the status of your documents online through our website.